The Arbiter Systems®, Inc. Model 935A Current Source is designed to drive high currents, up to 1000 amps rms, through low impedance loads. Output current is produced at the input line frequency through a toroidal current transformer. The input line level is selectable from 100 Vrms, 120 Vrms, 200 Vrms, 220 Vrms, and 240 Vrms. An output range selector switch and variable transformer allow easy setting of the output current within the attainable range. 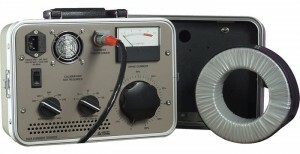 The Model 935A is an ideal source for testing instrument current transformers. Use the Model 935A Current Source in conjunction with the Model 931A Power System Analyzer and the Model 936A Reference Current Transformer to accurately measure the ratio and phase angle errors on a wide variety of current transformers.